Raku’s beatdown by his female high school classmates continues. Raku’s “big sister” Yui Kanakura suddenly returns from China, throwing Raku for a loop. Yui grew up with him and the other girls, but is a couple of years older and seemingly remembers more than she has let on about Raku’s mysterious locket and the keys the other girls all have. However, things get odd quickly when Yui turns out to be Raku’s new homeroom teacher and is discovered to have a key of her own! Of all the most recent volumes I’ve reviewed of Nisekoi, I felt like this fourteenth volume was somehow the best showcase of everything good and everything bad about the series. It’s a recurring theme for me to discuss how Nisekoi has begun to feel stagnant, and that definitely holds true in this volume. Given the long-running nature of this trend, it becomes more significant with each book. However, the introduction of Yui Kanakura (more on that in a second) serves as an interesting, if flawed, arc and a couple of the chapters stood out as particularly funny for me. As the name for this volume is “Big Sister”, it should come to no surprise when I say that the subject of the major arc in the volume, Yui Kanakura, turns out to have played the role of Raku’s older sister in the past. Although they are not related by blood (of course), they treated each other as siblings. Of course, Yui’s introduction plot-wise boils down to what is essentially a new way to add another girl as a potential love interest for Raku. I wish author Naoshi Komi had kept the relationship between them platonic, but unfortunately this was not the case. Additionally, Since Yui was older than Raku and all the other girls, you would think that she might have some information about the circumstancing surrounding all the mysterious keys. However, Yui decides instead to keep that information hidden so Raku can decide for himself, creating another of Nisekoi’s famous backpedaling-right-before-romantic-development moments. While the above details are annoying, you probably would have guessed (or at least I did) that they would happen. If you’re a fan of Nisekoi as-is, then Yui’s addition creates plenty of opportunity to take advantage of the new character to keep the usual comedy fresh. Yui plays up the big sister archetype, is the leader of a shady Chinese organization that she inherited upon her father’s death, and also decides to become Raku’s new homeroom high school teacher. These things may sound a bit non sequitur, but in a story like Nisekoi where everyone is somehow the heir to a powerful organization, they work pretty well. Yui’s additions to the story are thus one of or a combination of these three primary traits, and the resulting humor is definitely funny. One such moment of hilarity was in chapter 122, entitled “Conference”. Yui, as the teacher, has to give parent-teacher conferences with all the students to discuss their potential careers. I actually think this was probably one of the best chapters in a while, as it managed to pull together almost the entire cast (including the parents) and successfully exploit the running numerous running jokes between characters. And that’s what’s really important at the end of the day: Nisekoi is still funny. 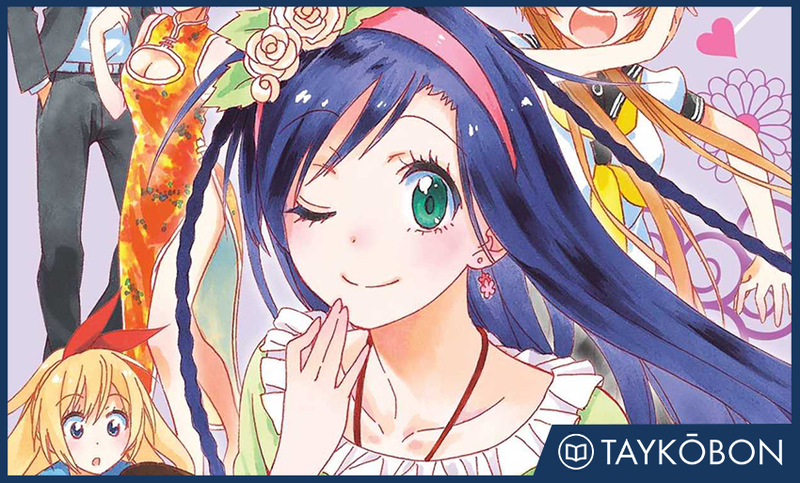 There’s a consistent quality to Nisekoi’s comedy, characters, and illustrations that long-time fans of the series are familiar with, and the series is far from done dishing out more of it. Nisekoi’s 14th volume keeps things interesting with the introduction of Raku’s “big sister” Yui Kanakura. While many of the same old flaws of severe following of tropes and lack of progression definitely continue, the humor and general quality of production keep up as well. If you were hoping for significant progression, then once again this volume won’t be the answer. However, Nisekoi is still funny and manages to keep its brand of humor fresh with new faces. Nisekoi is an ongoing series in Shueisha’s Weekly Shounen Jump, and began serialization in November 7th, 2011, before receiving two anime adaptations by animation studio Shaft in the Winter 2014 and Spring 2015 seasons. The manga is also currently serialized in Viz Media’s Weekly Shounen Jump imprint and translated by Camellia Nieh. Volume 14 was released on April 5th with volume 15 planned for May 3rd.